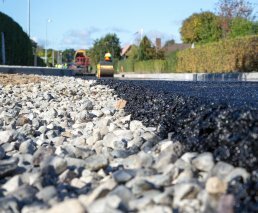 In the town of Galten, Skanderborg Municipality has designed a permeable road, Permavejen, that permits rainwater to pass through the asphalt and transports it to the nearby park. On Permavejen in Galten, protection against climate change is implemented while also fulfilling a need for recreational urban space for the city’s inhabitants. The road is made of permeable asphalt, meaning that in the event of rainfall, the water flows through the asphalt rather than overflowing. The road is constructed with a membrane which creates a pool beneath the road, ensuring that any contaminated water does not contaminate groundwater. At the same time, the reservoir makes it possible to handle a quantity of surface water equivalent to a 1-in-100-year-flood. The rainwater is thus stored and gradually led into the traditional rainwater system over time. The reservoir is an integrated part of the cityscape, with recreational facilities such as skate parks, tennis courts, amphitheaters and living areas. The road protects the Galten town center and stores from the influx of rainwater 18 hectares upland, while the recreational area enriches the municipality, ultimately making it a better place for citizens to live. Permavejen lets rainwater pass through asphalt, catching it in a membrane that acts as a rainwater pool beneath the road. The membrane beneath the road leads rain and wastewater into a temporary storage space, while simultaneously protecting groundwater from contamination from overflowing sewers. Permavejen is an integrated water management approach. In addition to managing water levels on asphalt, it increases the city’s sustainability and minimizes flood-related economic losses.